I love the Leicaflex SL, but I understand its not for everybody…or even most people. It’s big, and clunky and is brick heavy. In its day it cost half as much again as its competition – The Nikon F – without offering nearly as much system versatility; no interchangeable prisms or even focusing screens, no alternative backs or motors, extremely expensive but limited optics. Its not surprising, then, that the Leicaflex system never really caught on with professional photographers as an SLR system camera. Leitz had only reluctantly accepted the public’s move from rangefinder to SLR and was slow to market a Leica SLR camera. Nikon had beaten Leica to the punch by 5 years with its comprehensive and affordable F system, and it didn’t help that Leica’s initial ‘standard’ Leicaflex (1964-68) was hopelessly outdated upon introduction, using non-TTL metering from an opening on the face of its reflex pentaprism. Ungainly and inaccurate. 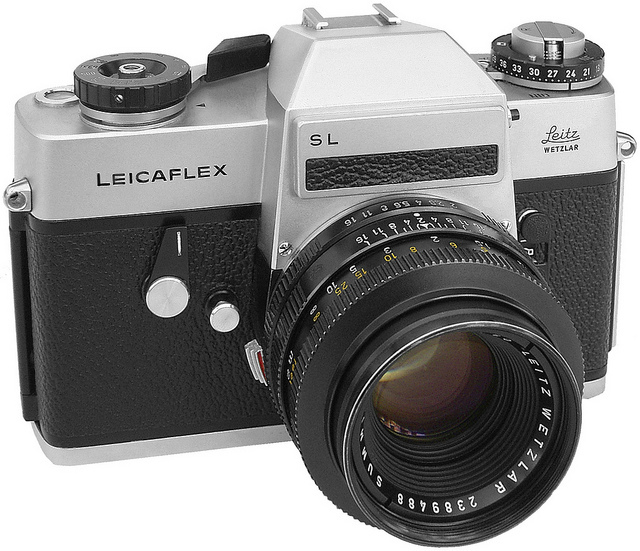 By the time the SL was introduced in July of 1968, the Leicaflex system was an afterthought for most photographers. Given the late start, It also didn’t help that with the introduction of the SL Leitz chose a commercial policy of selling the SL and SL2 bodies at a cost below the cost of manufacture i.e. for every one they sold they lost money. The hope was that the money lost on bodies would be made back on the sale of Leitz lenses. The fact that Leica lost money on every Leicaflex sold should tell you something about the camera itself: while the Nikon F with metered prism sold, presumably for a profit, for $400, the SL sold, at a loss, for over $600. Pick one up and use it, even today, and you’ll understand why it cost Leitz so much to produce the SL. As a teenage boy coming of age photographically in the early 1970’s, what I desired was a Nikon F, only because the Leica M5 was simply too expensive to contemplate. 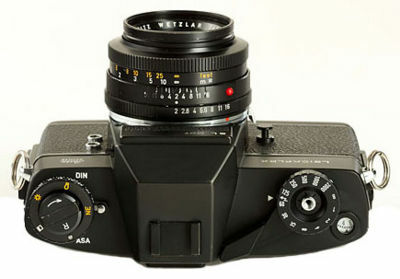 I never much thought of the Leicaflex SL. Seeing it in the store advertisements in the backpages of Modern Photography and Popular Photography, It seemed a brutalist Teutonic oddity that even Leica never totally embraced, it and its lenses priced in the stratosphere. Leica ceased production of the Leicaflex in 1976 and thereafter concentrated most of its efforts on the M system, a decision that at the time seemed suspect but now appears inspired. In 1976, as an 18 year old, I purchased my first Leica, an M5 bought new at a discount (but still expensive) price from Cambridge Photo in NYC. In 1984 I purchased one of the first production M6’s. Since then I’ve owned and operated almost ever M model made, and currently own an M2, M4 and two M5’s. But I never much thought of the Leicaflex; it was only recently, almost as an afterthought, that I discovered the classic simplicity of a Leicaflex SL. I met a nice woman who was selling her father’s camera collection. Her father had owned 3 camera stores in the Boston area in the 60’s and 70’s, and he had been a Leica enthusiast. He had set aside a boxed SL with 50mm Summicron R and Leitz leather camera case and used it infrequently, if at all. It looked unused. I paid less for the entire boxed affair than most people pay for a smartphone they’ll throw away in 2 years. The SL just may be the high water mark of Leitz’s traditional hand-built manufacturing prowess. What it lacks in aesthetics it more than makes up for in feel and workmanship. As with the M’s, nothing superfluous has been added for commercial appeal. The Leicaflex SL is mechanical simplicity defined, with a heft and feel that makes the F seem cheap and flimsy by comparison. Close you eyes and wind on the film and you’ll swear you have an M in your hands. Look through the viewfinder and find a size and brightness that puts the F to shame with its low light focusing capabilities. Plus you get to use the wonderful, albeit expensive, Leitz lenses. Ultimately, I had to decide: was my perfect SL to be a collector’s shelf queen, or would I use it? It was easy enough decision after I’d handled the SL – you use it and you marvel at your fortune in owning such a wonderful precision instrument. This entry was posted in Cameras and tagged leica, Leica M, Leica M4, Leica M5, Leica Rangefinder, Leicaflex, Leicaflex SL on August 16, 2013 by Leicaphila.